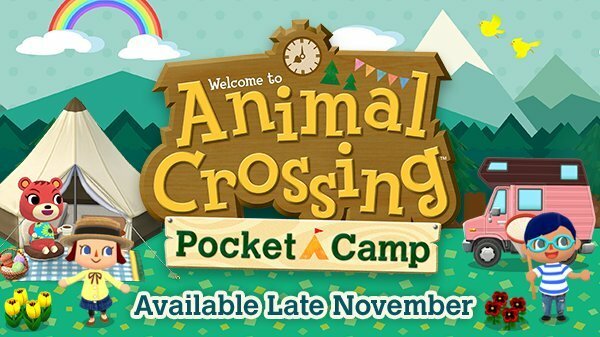 This evening Nintendo officially revealed Animal Crossing Pocket Camp, a game where you play as a camp site manager, gather materials, and then craft all sorts of things to trick out your camp. The graphics look stunningly similar to a console animal crossing game, and as part of the demonstration they showed interacting with other NPC’s to earn materials which you then order and place in your camp site, which is shockingly similar to the way you’d decorate your house in Animal Crossing proper. You can also decorate the yard surrounding your camp site, and the interior/exterior of your camper. Other characters also have friendship levels, and if you decorate with a particular character’s favorite furniture, they’ll come hang out at your camp site. Leaf Tickets are the premium currency, and allow you to skip basically anything in game (like any free to play game). The island also appears in game, along with a forest, river, and other locales to adventure in. OK Motors is a new shop added to the game, and it seems like the camper serves a similar role as your house in proper Animal Crossing games with players taking out loans and adding floors to their campers. You’ll pay off your loan by earning bells through collecting things in game. Using your Pocket Camp Player ID, you can visit other players, have them stop by your camp site, and even buy things from their camp site Market Box similar to how the farm stand works in Hay Day. Public Works projects from New Leaf also sort of make an appearance, with “amenities" you can add to your camp site (the example shown was a pool). These amenities build in real time, and furniture orders are also built in real time. Of course, Leaf Tickets can speed those up. Leaf Tickets also get you access to special parts of the game where loads of resources can be gathered. Leaf Tickets can be earned while playing the game. Pocket Camp will have seasonal events, exclusive items, and all sorts of other things that you can miss if you don’t play often. Loads of details from Nintendo, and the game will be available in late November.